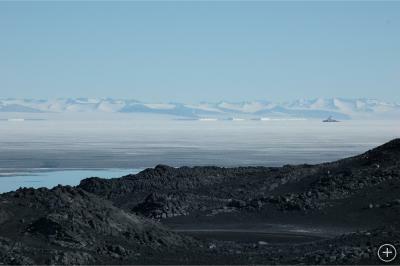 CAPE ROYDS, ANTARCTICA– I’m sure Inuits have a name for it, but otherwise it’s the fizzing sound as great expanses of ice dissolve so rapidly that any air still between its spaces or molecules is released into the atmosphere. We heard that sound again two days ago at Cape Royds, having heard it before in January 2005, when a several square kilometer opening appeared in the fast ice just offshore in a matter of hours. The ice was dissolving, or would we call it melting?, and it was happening so fast that you could see it disappearing without even needing your imagination to be going overtime. It’s kind of like putting an ice cube in a cup of boiling tea water to watch it disappear; only here the water is just a degree above freezing. That’s plenty warm as ice goes. 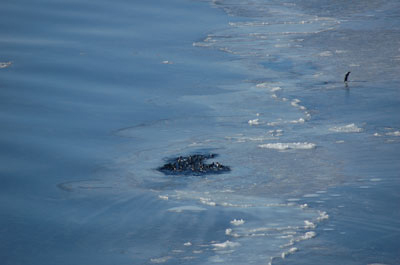 In 2005 the fast ice was thinner, so it went from white ice to blue water; this year it was much thicker, so for a couple of weeks it slowly turned darker shades of gray, as it took on more water. Then, fzzzzzzz. Otherwise, except for this new patch of open water within the ice, called a polynya (a Russian word; without a doubt the Inuits have a name for this, too), there is still fast ice to the horizon as I have described in various of my previous dispatches. The Swedish icebreaker Oden going south, very slowly, through the ice a few kilometers out in McMurdo Sound, while a polynya begins to form next to Cape Royds. 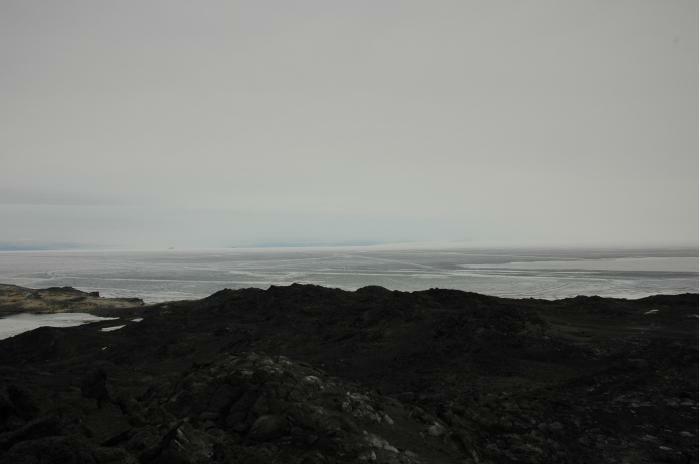 The south ‘shore’ of the polynya, the day after it initially formed, showing proximity to the Cape Royds penguin colony (tan area on left side of image). 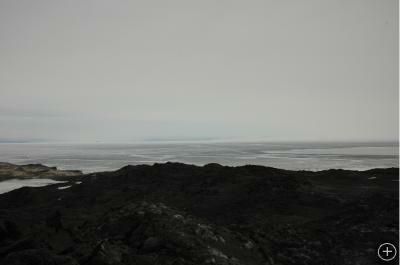 The polynya is to the right, beginning to dissolve the gray ice in the center of the image. In fact, in the Arctic, Inuit villages — and, for that matter, seabird colonies — are located near to polynyas. 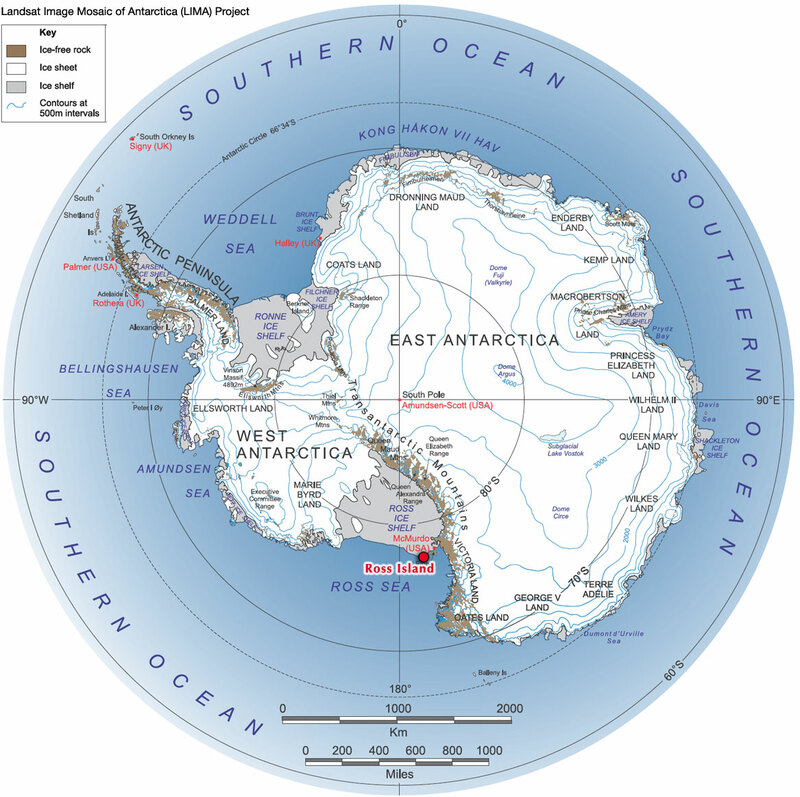 And, wouldn’t you know, so are penguin colonies, although at the opposite end of the Earth. This is because polynyas allow these predators much easier access to their food. 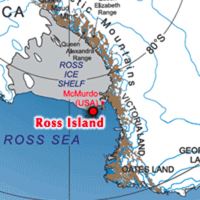 Normally, McMurdo Sound is one big polynya, and the penguins are here at Royds because of it. As I’ve been making the point in previous dispatches, the Royds penguins have been having a hard time of it this season, because their polynya didn’t form, owing to calm winds which allowed the ice to thicken until not even the strongest winds could blow it away. So, they’ve had a very long walk to get food. That is, up until a few weeks ago, when the few remaining penguins still having chicks were provided a large crack to feed in, just 4-5 km north of the colony. Now they’ve got a full-fledged, mini-polynya and all is right in the World! Well, just like in 2005, within a day of the polynya forming, a couple of minke whales showed up in it! Where they came from, I’m not sure, but they may have followed the Oden into the ice (35 km from the fast ice edge), and then pealed off when a crack that intersected the icebreaker channel allowed them to get to the Cape Royds polynya. Maybe they heard it fizzing! Or the sounds of joyful penguins! 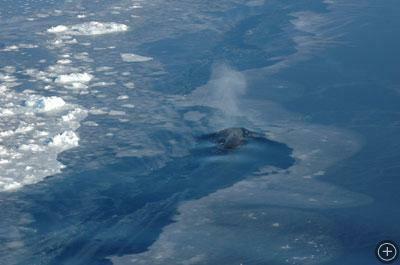 The minke whales, for several hours, cruised around the polynya feeding all the time. They’d submerge for 6-8 min at a time and likely were like big “Hoovers”, i.e. vacuum cleaners. Between dives, they exhaled (i.e. whale “blows”) 4-5 times, clearly audible in the still air from a kilometer away. 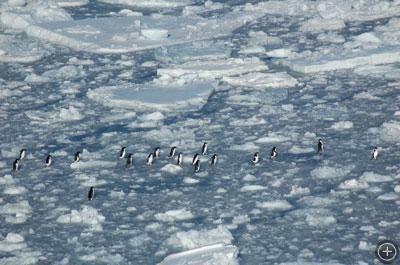 Within a couple of hours after the whales’ arrival, the penguins’ diet switched from krill to fish. I’d been monitoring it by watching what passes between adult and chick everyday for the past few weeks. Wow! I knew that the whales could do this to the penguins, but I didn’t realize that the whales were so efficient! Not long after the whales left (they’ve not been seen for about 24 hours now) the penguins’ diet switched back to krill. Therefore, this is pretty good evidence for what we call “interference competition”. The whales certainly eat a lot but also their vacuuming causes the krill to try to escape, of course. And what krill do when being pursued, if they can, is to dive deeper and, it seems, deeper than penguins want to go, especially when there are enough fish to be had at shallower depths, though apparently not in a density that in this case would interest a minke looking for easy pickings. If the whales had vacuumed all the krill, when they left, there would be no food for the penguins. As it was, the krill ventured back up into the light (where the phytoplankton occurs that the krill eat), to then be caught by the penguins again. Both whales and penguins go for the easy meal, i.e. that nearest the surface. 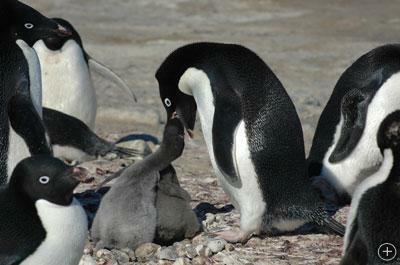 Parent feeding its chick. With binoculars, if you get the right angle, usually it is possible to determine whether krill (pink) or fish (gray) is being fed to the chick. Well, so, you’d think that maybe whales are an annoyance to Adélie penguins. As it turns out, though, minke whales are life savers! Adélie penguins, if given a choice, would always want to have minke whales around, despite the whales’ appetite and despite the best (?) efforts of the Japanese whalers. You see, minke whales — because, like Adélie penguins, they are pack ice denizens — have evolved a very long and sharp “beak”. When you see the whales in areas were the sea is freezing, it becomes quickly obvious why this is a good thing. The whales use their rostrum to break breathing holes in the new ice. This ice is thick enough that penguins walk over it. With the whales around, though, the penguins can swim between whale breathing holes much faster than walking. In fact, several years ago, when on an icebreaker at the time of ice freeze-up in the Amundsen Sea, one day there were whales and penguins swimming around, and then the next day, with a dramatic drop in temperature and a freeze, there were whale holes but no whales or penguins. Together, they had escaped north far enough to move away from the area of freezing. A minke whale pushing up through recently frozen sea ice, the ice around it being 4-5 cm thick. All but one of these penguins found a hole left by a minke whale; the next whale breathing hole is just behind the lone penguin and this flock of penguins is next going to appear in that hole. These penguins are not walking on frosted glass. They are walking on ice thick enough to support their weight, but not thick enough that a minke whale could not break a hole. 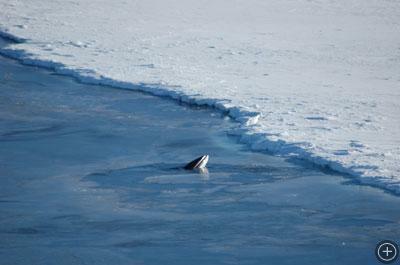 It is good for Adélie penguins to have as many minke whales around as possible. This one, like the pied piper, is making a “channel” through new ice, soon to be followed by a flock (school?) of penguins, who would much rather swim than walk. Penguins need whales, especially minke whales, as friends. it’s inspiring to read about this inter-species relationship–both depending on the robust Ross Sea ecosystem. Sure wish I was there to see it, but your dispatch and pictures are the next best thing! David Ainley has been working with Adélie penguins at four different colonies on the Ross Sea of Antarctica for more than 25 years. He's a biologist for H. T. Harvey and Associates and is a leading expert on how these resilient birds respond to environmental change.